Still looking for that perfect gift book, for a high school graduate, off on their way to college? 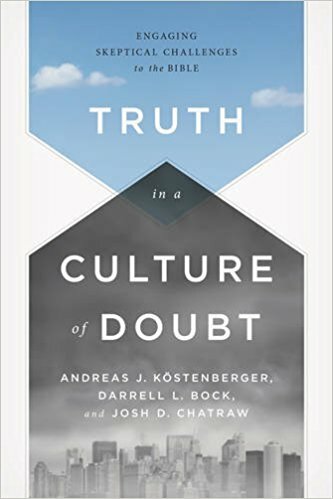 Consider Truth in a Culture of Doubt: Engaging Skeptical Challenges to the Bible, by Andreas Köstenberger, Darrell Bock, and Josh Chatraw. Young people growing up in the church today face immense challenges from a culture skeptical to the Gospel. Leading the charge towards encouraging doubt is popular author and University of North Carolina religion professor, Bart Ehrman. If you have never heard of Bart Ehrman before, you need to get out from underneath your rock, and learn about him. Ehrman grew up going to church and attending Christian colleges, but eventually lost his faith in the process. He has since authored five New York Times Bestsellers, and dozens of other books, all aimed at undermining confidence in the reliability of the Bible and its message. What makes Ehrman’s skepticism so caustic, is that he knows his facts really, really well. He knows his Bible better than most Christians do, and he remains one of the world’s top textual critical scholars of the New Testament. The problem is that the conclusions he draws from his research are not always warranted. There are indeed very good answers to the issues he raises, that affirm the trustworthiness of the Bible. Is God Immoral Because He Allows Suffering? Is the Bible Full of Irresolvable Contradictions? Are the Biblical Manuscripts Corrupt? Are Many New Testament Documents Forged? A nice little extra is a quick question and answer guide at the back of the book, that summarizes the basic arguments. Truth in a Culture of Doubt is an updated, more in-depth version of an earlier book by these evangelical scholars, Truth Matters, that I reviewed a few years ago. Though Truth in a Culture of Doubt was itself published back in 2014, the information packed in it is still relevant today, as the issues dealt within are not going away any time soon. Ehrman is still himself writing books, but more and more, any new issues that he writes about move further away from his area of expertise. In many ways, the topics that Ehrman has been writing about for over fifteen years are not new. They are no more than popular distillations of scholarly, critical views in the history of Christianity, that have been taught in secular departments of religion at private and public universities for nearly a century now. Sadly, it has taken a barrage of these skeptical writings, in popular form, to force the evangelical church to better inform her people, and give better answers. Read a brief excerpt from Truth in a Culture of Doubt here, then go buy the book for that young person you know, who is facing challenges from a skeptical culture. During this break from the Veracity series on the baptism in the Holy Spirit, I could not passover a recent news item. Greg Laurie, the dynamic evangelist and California megachurch pastor of Harvest Christian Fellowship, announced earlier in June, 2017, that his church would join the Southern Baptist Convention. Why is this significant? Let me explain. Greg Laurie’s Harvest Christian Fellowship is the eighth largest church in America. Greg Laurie, and his church, came out of the Calvary Chapel movement, that began in the early 1970s in Southern California. What is notable for those interested in the teaching of the “baptism in the Holy Spirit,” is that historically, the Calvary Chapel movement has been associated with the charismatic revival, that hit mainstream evangelicalism, starting in the 1960s. Calvary Chapel-type churches, like Laurie’s, are therefore not cessationist in their doctrinal teaching, Cessationism is the teaching that the miraculous gifts of the Spirit ceased to operate after the end of the apostolic age, in the early church. Instead, Greg Laurie would most likely affirm a continuationist view, that the miraculous gifts of the Spirit continue to operate today within the worldwide church. What makes this quite interesting is that the Southern Baptist Convention, the largest Protestant denomination in America, has historically been cessationist, when it comes to these types of issues. Southern Baptists do not have an official teaching position about “speaking in tongues.” But it appears that the long-time, historical resistance to the charismatic movement could be changing in Baptist circles, as the Southern Baptist International Mission Board rescinded its policy of banning charismatics from becoming overseas missionaries, just a few years ago. It would be careful to note that Greg Laurie’s position, while surely not banning charismatic gifts, is much more low-key than what you find in classic Pentecostal churches. You might hear “speaking in tongues” in small group meetings, but rarely, if ever, in a corporate worship setting. So, what does this mean for the Southern Baptists and for Greg Laurie’s Harvest Christian Fellowship? With respect to the charismatic movement, it is difficult to say. Is the charismatic movement declining among the Calvary Chapel-type churches, such as Harvest? Or are the Southern Baptists warming up even more to the miraculous gifts of the Holy Spirit? Is this part of a general, shifting trend throughout the evangelical church at large? If so, what is this shift? What do you think? Below is the announcement from pastor Greg Laurie.